Golf Tribute in Memory of Earle Denton « Central Florida Veterans Memorial Park Foundation, Inc.
Earle Denton was a long term member at Rio Pinar Country Club (since 1969) now Rio Pinar Golf Club . He joined it the first day he was assigned here. When George Ryan cleaned out his golf locker after his death he found a few dozen balls and conceived the idea of giving Earle a golfing “21 gun” salute into the pond at hole #12. 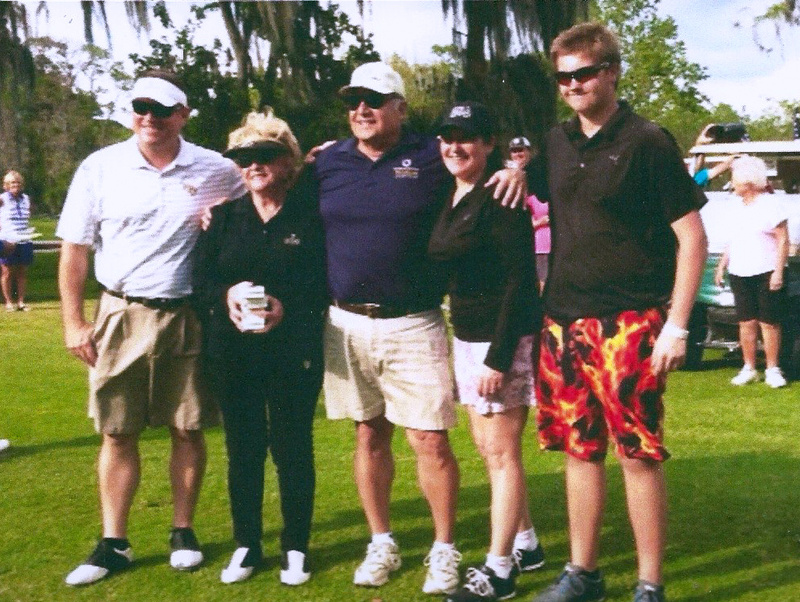 George arranged a golf tournament and it was decided to make it a fundraiser for Earle’s favorite charity CFVMPF now known as Veterans Memorial Lake Nona. A number of folks signed up to play in this scramble Sunday afternoon March 20 for this tribute. $1200.00 was collected and or donated for this event. This photo depicts the salute with (from left to right) Randy Krizmanich, Rob Teegarden, Mike Motko, Scott Stambaugh , Dan Schyvinck. Photo 2 shows George Ryan, Vinnie Oliveri, Carol Denton, Susan Denton observing the shootout. In addition a Magnolia tree was planted and a plaque installed in honor of Earle L Denton at the tee by hole 17. This entry was posted on Wednesday, May 25th, 2016 at 7:44 pm	and is filed under Uncategorized. You can follow any responses to this entry through the RSS 2.0 feed. Responses are currently closed, but you can trackback from your own site.